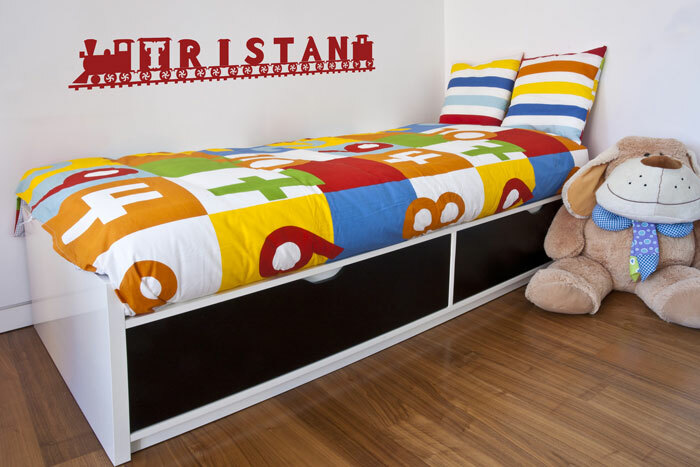 Get your child’s name personalized in this adorable Train design! Perfect gift for birthday parties and baby showers. A beautiful and personal statement piece. Arrives in one piece for easy application. Trains evoke memories of picturesque countryside. For kids, its the thrill of traveling in such an ‘odd’ means of transport. It’s lots of fun! At DecorativeLettering we have come up with a novel way of thrilling your kids with this captivating and powerful machine. Its a creative way of decorating their walls with their names. The ‘Name Train Custom’ wall decals are unique and look good on the walls. We tried it out by applying the train wall decals above the bed. This bedroom has a train theme: the bed looks like one. The wooden floor and the wall words give the room a warm and bright feel. Your kids will love sleeping in this room! Are you looking to decorate your kid’s bedroom walls with a unique theme based wall words? Try products from DecorativeLettering. They are affordable and durable. Our wall quotes are easy to apply: it takes only a few minutes to transform your walls! You will receive practice lettering to help you learn how to apply. You may even sign up for our customer awards program: you’ll earn points with each purchase. You may redeem the points or gift them to a friend. Staying with the gift issue: our wall letters are excellent gifts for housewarming parties and weddings! They are a great investment. 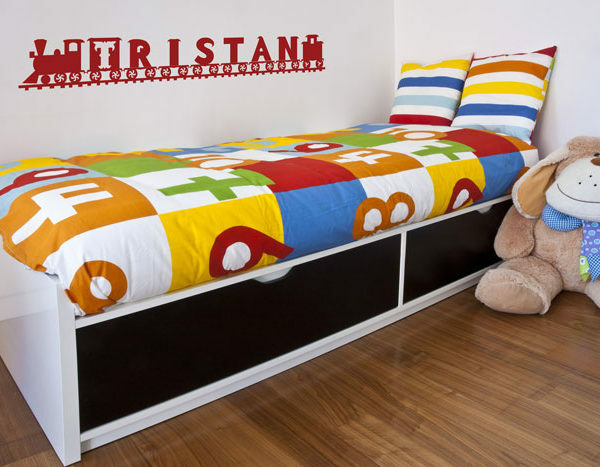 Our team of designers are experienced and will deliver high-quality wall quotes that you and your kids will enjoy. Do call or email: we would love to hear from you.